A brilliantly charismatic – and controversial – character, Don Frye was also undoubtedly one of the very best fighters of the Pioneer Era. Here, in his own words, the UFC Hall of Famer describes this astonishing UFC run. 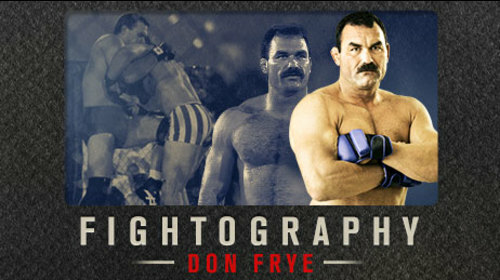 Fightography: Don Frye Aug 27, 2015 (9:28) A brilliantly charismatic – and controversial – character, Don Frye was also undoubtedly one of the very best fighters of the Pioneer Era. Recruited to the UFC by friend Dan Severn, “The Predator” identified strongly as a “No-Holds Barred” brawler but, in fact, was actually one of the original mixed martial artists, having competed at a high level in wrestling, boxing and judo. Those skills enabled him to cut a swathe through the UFC in 1996, where he won two tournaments, was runner- up in a third. Here, in his own words, Frye describes this astonishing run in the Octagon. Don Frye vs Thomas Ramirez UFC 8 Feb 16, 1996 (6:24) From watching on the sidelines to fighting in the cage, “The Predator” Don Frye was a decorated collegiate wrestler under and training partner for Dan Severn, but, at UFC 8, he was simply a debuting fighter taking on another rookie in Thomas Ramirez. Don Frye vs Sam Adkins UFC 8 Feb 16, 1996 (7:11) As Paul Varelans was forced to withdraw due to injury, Sam Adkins earned the semifinals spot with a quick stoppage via punches in the alternate bout, but not as fast as his opponent Don Frye who scored a lightning quick 8 second KO in the quarters. 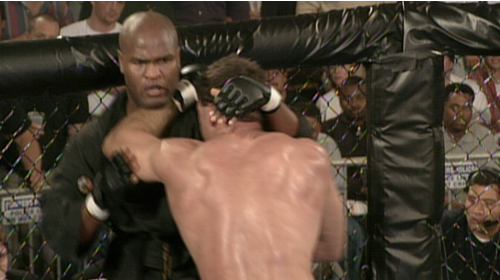 Don Frye vs Gary Goodridge UFC 8 Feb 16, 1996 (16:11) UFC 8’s tournament final featured a pair of Octagon newbies in “The Predator” Don Frye and “Big Daddy” Gary Goodridge who had quickly shown fight fans in attendance how formidable they are with their respective highlight reel KO/TKO victories. 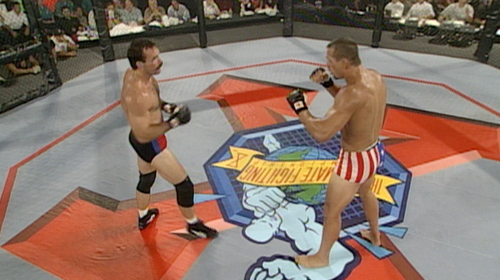 Don Frye vs Mark Hall UFC 10 Jul 12, 1996 (18:56) To open up the quarterfinals, 4-0 wrecking crew Don “The Predator” Frye put his head-hunting ways to good use against taekwondo blackbelt Mark Hall, who scored his first Octagon win in previous appearance at UFC 9. 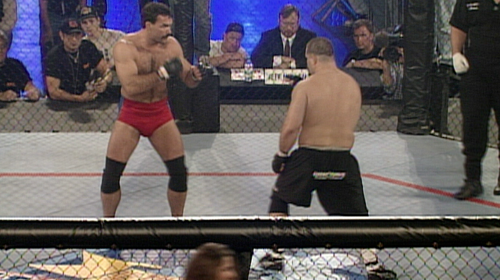 Don Frye vs Brian Johnston UFC 10 Jul 12, 1996 (9:34) An undefeated KO/TKO machine Don “The Predator” Frye entered the Octagon for the 6th time as he set his sights on former Golden Gloves winning boxer turned pro wrestler Brian “Fury” Johnston. 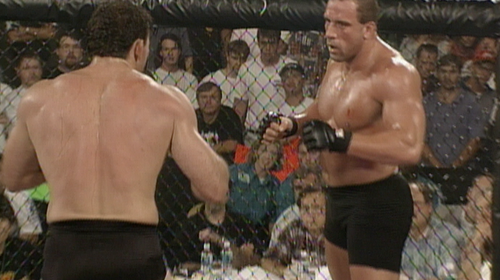 Mark Coleman vs Don Frye UFC 10 Jul 12, 1996 (18:08) Someone’s 0 had to go as two undefeated bulls locked horns in UFC 10’s tournament final as Don “The Predator” Frye looked for his 2nd tournament championship against hulking wrestler Mark “The Hammer” Coleman. 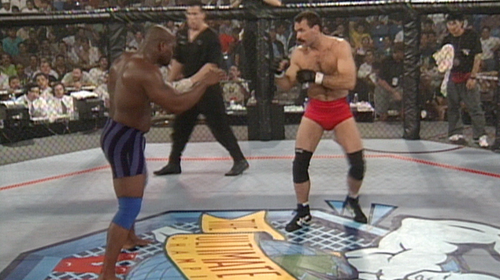 Don Frye vs. Gary Goodridge UFC 11.5 Dec 7, 1996 (17:42) In a rematch of the UFC 8 tournament final, the all around threat Don “The Predator” Frye was ready to take on formidable foe “Big Daddy” Gary Goodridge. In their first meeting, Frye took it quick. Would the rematch be as easy? Don Frye vs. Mark Hall UFC 11.5 Dec 7, 1996 (6:21) Taekwondo blackbelt Mark Hall nabbed a quick TKO finish in an alternate bout to secure his semifinals spot, as a replacement for a fatigued Kimo Leopoldo, against fan-favorite and UFC 8 tournament winner Don “The Predator” Frye. 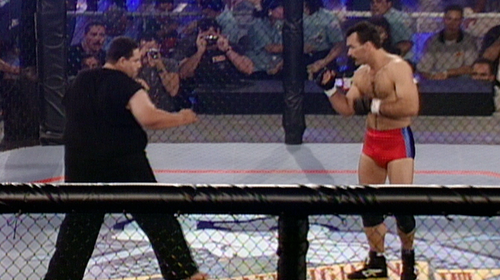 Don Frye vs. Tank Abbott UFC 11.5 Dec 7, 1996 (12:21) It was bound to happen at some point! Two of the meanest UFC tournament favorites, Don “The Predator” Frye was, finally, locked in the cage with David “Tank” Abbott in a finals bout that had all the makings of an Octagon classic.